Hey Everyone! 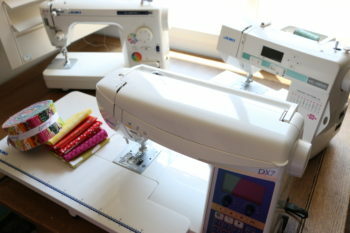 I have ready a very highly requested sewing tutorial! 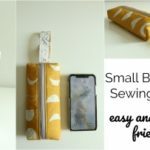 An easy zippered box pouch! Super fun, fast and easy to make these are perfect gifts. These don’t require a ton of fabric, so you can use some really fun fabric combinations. 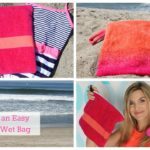 Interested in a stand up zip pouch and not this easy zippered box pouch? I have a post HERE. Attach the fusible fleece to the wrong side of the outside pieces of your box pouch using the manufacturers instructions. If you have any glue front he fleece exposed, use a pressing cloth so you don’t get your iron messy. Place zipper teeth side down on the right side of the outside pieces along the 13 inch side. Watch the directions of the print if necessary. Place lining right side down (so right sides are together) and clip lining, zipper and outside piece together using pins or clips. Sew zipper in place using regular foot or zipper foot. Now Sew the other side of the zipper in place. Put walking foot on the machine if you have it. Fold pouch in half with the outside pieces touching and sew the bottom edge of the bag closed using a 1/2 inch seam allowance. 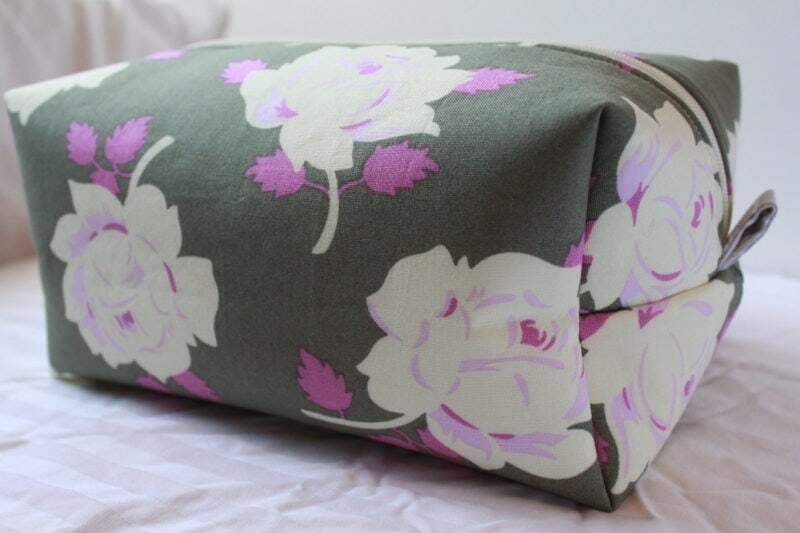 Use a serger or zig zag stitch to finish the seam. Open zipper at least half way. Match up bottom seam of the bag (that you just completed) to the side of the zipper with the metal end pieces. fold the pull tab in half and place the raw edge along the bottom seam and zipper, pin in place well. Pin the rest of that side of the bag. On the other side with pin the pull tab centered with raw sides together on the bottom seam. Pin the zipper with a slight overlap in place. This will help the bag from getting a large gap as the feed dogs pull the bag through. Trim the zipper ends using no fabric scissors. Make sure the little metal end piece is trimmed off. Zig zag or serge the seams. Using a water soluble pen or something similar, mark the fold edges on the long side down about 2 inches on all 4 corners. Pop the corner out and line up the side seam with the marked line. Using a ruler measure down 2 inches from the tip of the corner and draw a perpendicular line between the 1 and 4 mark on the ruler and pin. Repeat on all 4 sides. Sew along the 4 inch line backstitching well. Trim the corners off leaving a 1/4 inch seam allowance. Trim threads and turn right side out using your finger to push out all the corners. 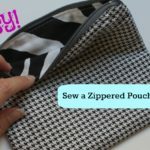 Here’s a full video tutorial to make your easy zippered box pouch! 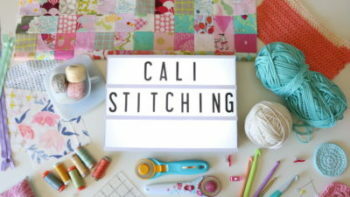 In search of some more sewing projects? This easy tote bag is a great companion to this box pouch! 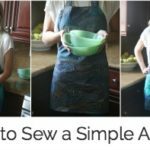 I’ve been sewing for years – great idea – I made one this weekend for my son-in-law. The next time I think I will make the outside and inside separately so the inside of the bag will look cleaner and you won’t see the seams. Me too. I really love the bag but the lining is not pretty at all and I didn’t realize until well into the project that it wasn’t a fully lined bag. 🙁 I wish I’d read your post 1st. Thanks for the post and video though. I learned a lot! Hi Melanie, I have made several of these bags and I’ve embroidered names and initials on them. They are so rewarding and make great gifts. My grandson uses his for his electronics to his computer, I pod, and kindle fire. It’s perfect for chargers and cords. Thanks for the info and tips. My printer can’t read the directions. Any chance you could send me a pattern? Would be more than willing to pay postage. Love doing things like that that are useful. My address is Joan Beedle, 789 E. Bethel Road, Attica, Indiana 47918. Please let me know. I am just starting on the different boxes out there and love this one. Hi Mel, tanx for the awesome tutorial. Please show me how to make a book cover. I love this – I made it slightly smaller so that it would work as a pen case,The best part is I FINALLY mastered zips – if only I had thought of the clover clips sooner (Mum won’t be seeing them any time in the near future!). I also made a few birthday presents with them! Love these. What are the finished dimensions? Thanks for the tutorial. Great for Christmas!! HAS ANYONE SOURCED THE PINK FABRIC? I AM GOING CRAZY SEARCHING FOR IT. Hey Melanie! Your zipper box pouch tutorial made it all the way to Argentina! I’m super happy with mine 🙂 It’s almost the first thing I sew with my machine and it looks so pretty, I can’t believe I made it myself. Thank you! Thanks so much for this awesome tutorial. I love it!!! You have some awesome fabric options. 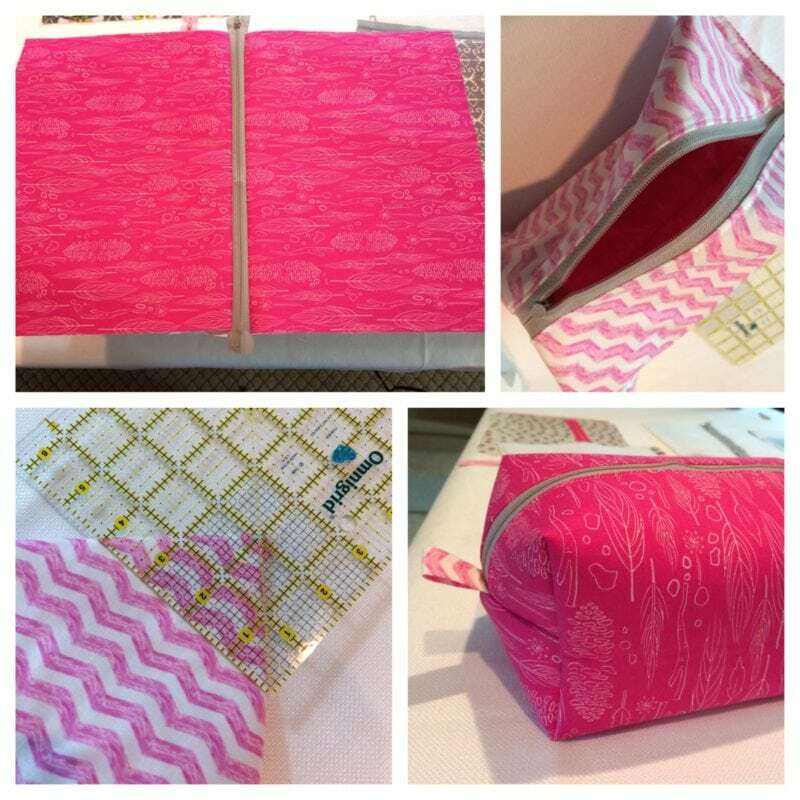 Would you mind sharing where you find these great patterns and matching zippers? GREAT TUTORIAL, THANKS FOR SHARING I LOVE IT! Great tutorial, I’ve made several of these for family & friends and still being asked to make more, just as well they are super quick. Hi I Love your videos!!! I made a zippered box pouch for a family member with some pairs fabric! What are the finished detentions for the box done in this video? I wanna make for teachers as gifts but wanna make sure it will fit a ruler. Thanks so much and keep the videos coming. Would love to know what water soluble pen you use in your video! I made one! The written instructions leave out the pull tab construction – so watch the video for that part. Excellent video and project! I’ll post pictures when I make this. I also love the clover clips. Best invention ever – especially when sewing layers. That and the walking foot. What are the finished dimensions of your zippered box when you start with 13 x 9-1/2? Have you ever tried making a different size box? If so, how do you figure the material dimensions needed to make a specific size box? 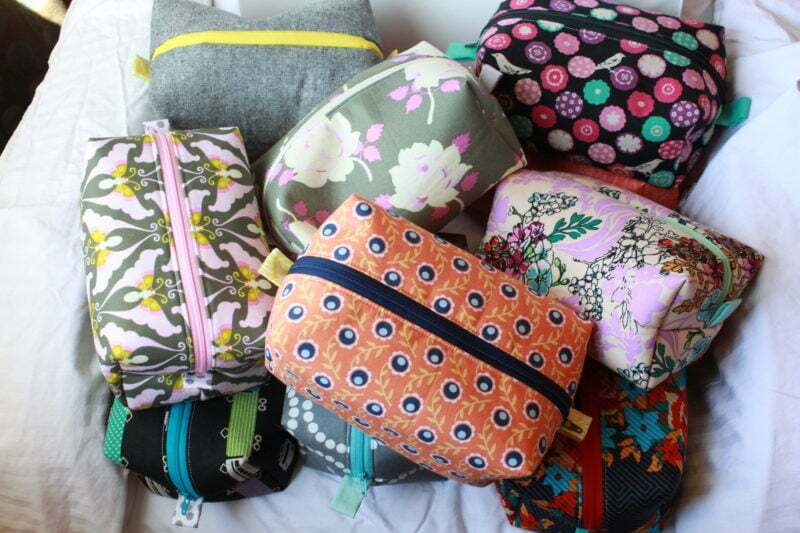 Hi, for my sister I made different sized bags to use as travel packing cubes. I guessed on the sizes: some were flatter and some were taller. I made them all of the same fabrics, and she uses them to travel. By using longer zippers, and adjusting the depths of the four inside corners, all sizes are possible. Good luck and have fun. Now all the grandkids want their own for school. I love these pouches. Thank you Melanie. Hi Melanie, you’re tutorial arrived even to Germany. I love the bag:) Do you have the mesurements in meters? 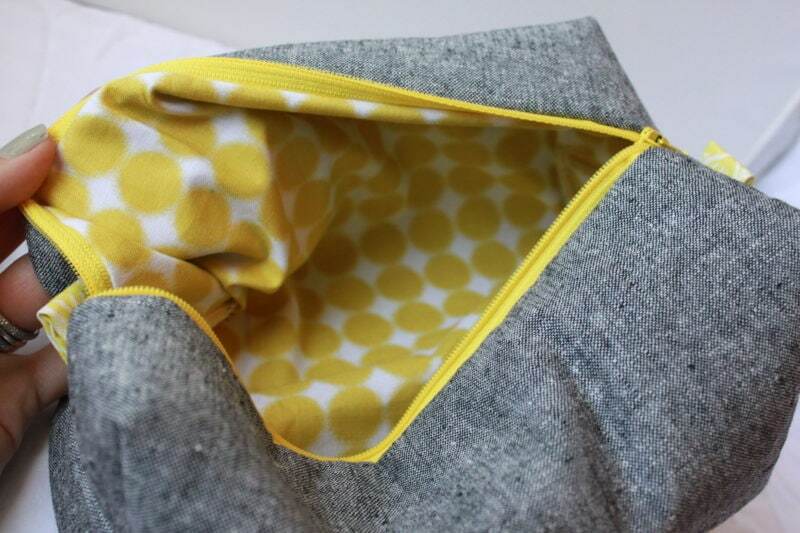 Have you found that certain types of materials work better than others for this pouch? A friend and I are going to attempt to make these as gifts in November, and I need to buy my materials ahead of time, Thanks! I have been able to print out all the words in ” Landscape ” mode, hope this helps !